The story of "the great thirst" is brought up to date in this revised edition of Norris Hundley's outstanding history, with additional photographs and incisive descriptions of the major water-policy issues facing California now: accelerating urbanization of farmland and open spaces, persisting despoliation of water supplies, and demands for equity in water allocation for an exploding population. People the world over confront these problems, and Hundley examines them with clarity and eloquence in the unruly laboratory of California. The obsession with water has shaped California to a remarkable extent, literally as well as politically and culturally. Hundley tells how aboriginal Americans and then early Spanish and Mexican immigrants contrived to use and share the available water and how American settlers, arriving in ever-increasing numbers after the Gold Rush, transformed California into the home of the nation's preeminent water seekers. The desire to use, profit from, manipulate, and control water drives the people and events in this fascinating narrative until, by the end of the twentieth century, a large, colorful cast of characters and communities has wheeled and dealed, built, diverted, and connived its way to an entirely different statewide waterscape. Norris Hundley, Jr. is Professor of American History at the University of California, Los Angeles. 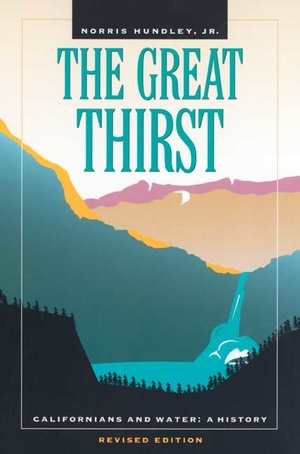 The Great Thirst, a bestseller in its first edition, was preceded by other books including California: History of a Remarkable State (with John Caughey, 1982). "Apportion Water Justly and Fairly"
"First in Time, First in Right"